how much they have remained the same. Even more significantis the fact that the song invokes something that transcends time and slaves and masters, something that was honored in Rome and Athens and will be honored as long as man breathes - something in man that does not love walls and chains." - Lerone Bennett Jr. Confrontation: Black and White Don't Forget!!! 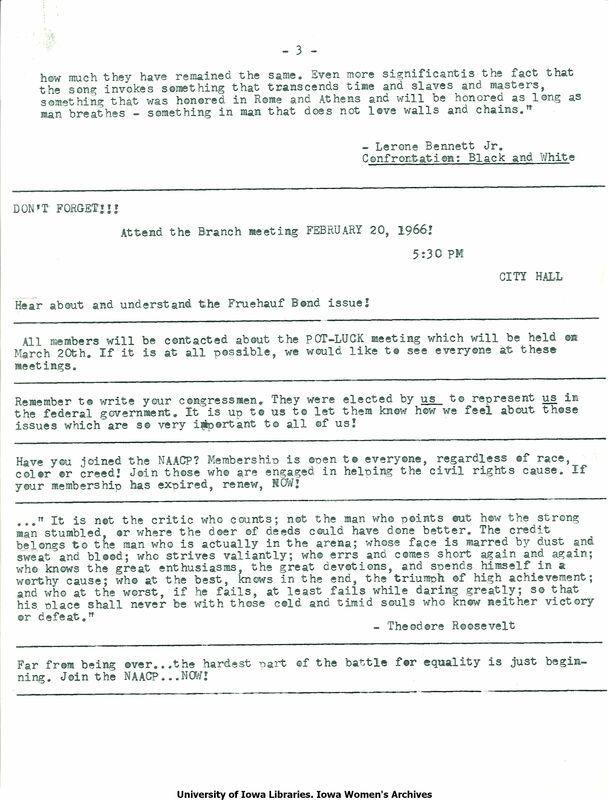 Attend the Branch meeting February 20, 1966! 5:30 PM City Hall Hear about and understand the Fruehauf Bond issue! All members will be contacted about the POT-LUCK meeting which will be held on March 20th. If it is at all possible, we would like to see everyone at these meetings. Remember to write your congressmen. They were elected by us to represent us in the federal government. It is up to us to let them know how we feel about those issues which are so very important to all of us! Have you joined the NAACP? Membership is open to everyone, regardless of race, color or creed! Join those who are engaged in helping the civil rights cause. If your membership has expired, renew, NOW! ..." It is not the critic who counts; not the man who points out how the strong man stumbled, or where the deer of deeds could have done better. The credit belongs to the man who is actually in the arena; whose face is marred by dust and sweat and blood; who strives valiantly; who errs and comes short again and again; who knows the great enthusiasms, the great devotions, and spends himself in a worthy cause; who at the best, knows in the end, the triumph of high achievement; and who at the worst, if he fails, at least fails while daring greatly; so that his place shall never be with those cold and timid souls who know neither victory or defeat." - Theodore Roosevelt Far from being over...the hardest part of the battle for equality is just beginning. Join the NAACP...NOW!